Does my post title make the old Carpenter’s tune pop into your head? I still enjoy listening to the unique sounds of Karen and Richard Carpenter–even after all these years. It is a rainy day, and a Monday here. Tropical Storm Debby is supposed to give us a second day of rain, but it’s okay, because we can sure use the moisture here. Ed’s back at work, and the house is quiet and lonely, and my kitchen table is still filled with ripening tomatoes! 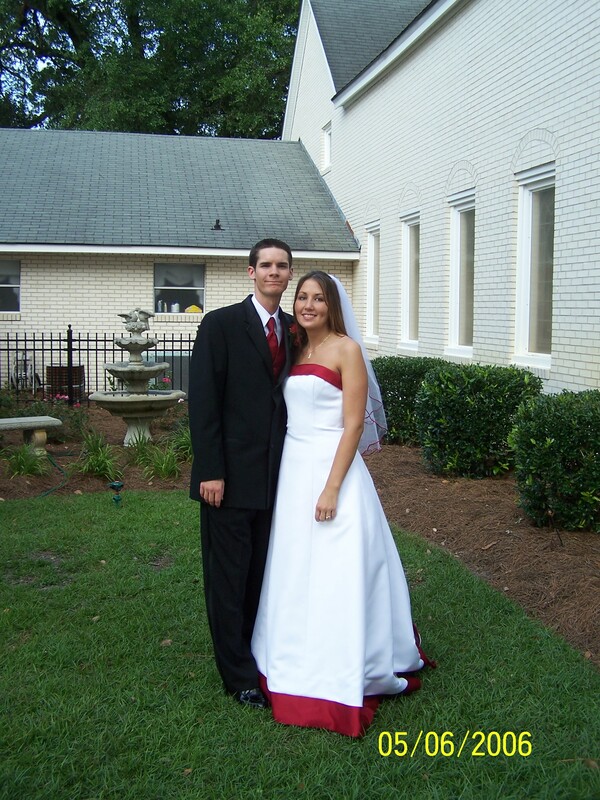 I’d like to wish our youngest son, Brad, and his wife, Jennifer, a “Happy Anniversary”! Their anniversary falls exactly a week after mine and Ed’s. As of today, the couple has been married one year! One year ago today, they were getting ready for their wedding– while today it’s a rainy Monday, and both are back at work after a long weekend get-away to Florida. Best wishes, guys. May your second year together be even better than your first! Without a doubt, my favorite toys were my Barbie and Skipper dolls. I didn’t get them until I was ten, but I played with them more than any other toys I ever owned. I still have both dolls, along with their original bathing suits. My Barbie and Skipper are 47 years old. We didn’t go anywhere this weekend, unless you count a quick trip to the Dollar Store. We had a quiet weekend at home, since it was the weekend after vacation week. I prefer paper, but these days it seems like nobody has paper anymore. I always end up with tons of those little plastic shopping bags, which I use as trash can liners in the bath and bedrooms. 5. How do you usually celebrate your wedding anniversary? 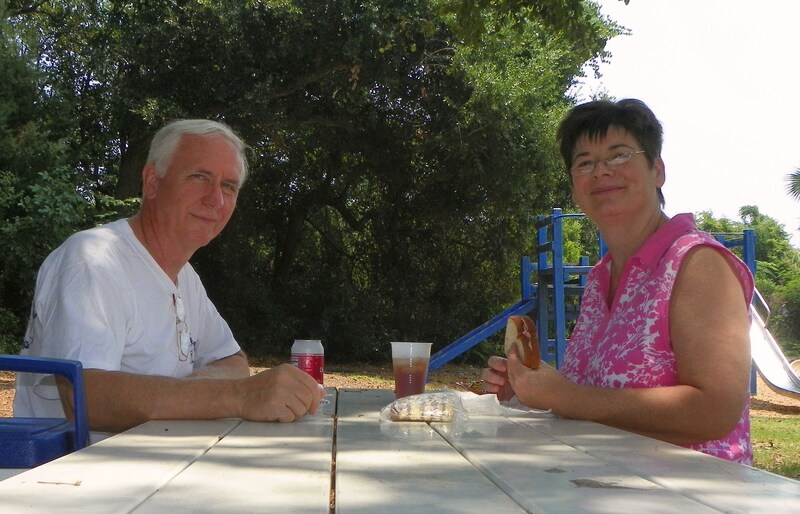 Here’s another shot of us eating our little picnic lunch beside the playground, which happens to be located beside a little saltwater creek. We were the only ones there for a while, and it was peaceful. Sitting there brought back many happy memories of days gone by…Times when we used to have picnics beside playgrounds with our children while they were growing up–and it was not so quiet or peaceful. Eating with three children, especially outside, is never peaceful, but it’s fun! One thing I’ve learned over the years of spending time around the beach area–the birds are BOLD! They are not shy when it comes to sharing your food! They will rip it right out of your hand if given a chance! Just look what happened when we left our lunch unattended for five minutes! 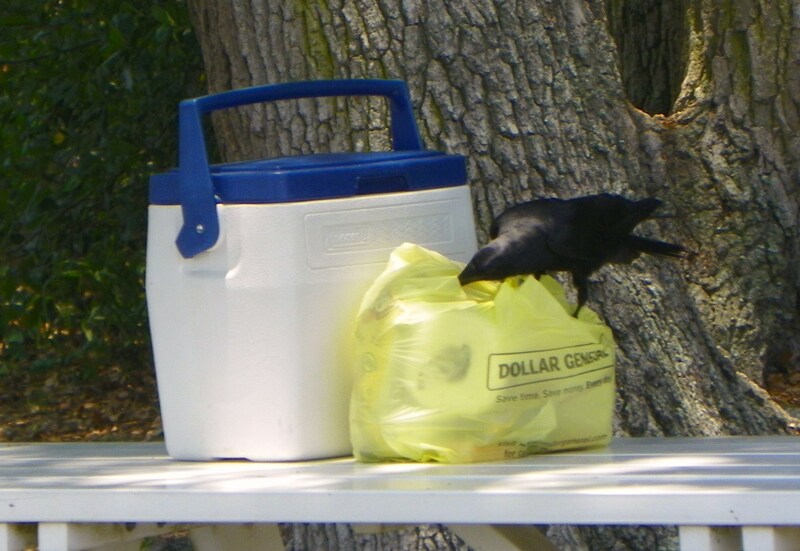 There wasn’t any food in the bag, but the thief managed to pull himself out a paper cup! I guess he was thirsty. He invited himself to lunch! We had a little time to kill before we were able to get into our hotel room, so we decided to check out historic downtown Fernandina. We’ve been there several times before, but we love it, so it never gets old. We took some pictures of the waterfront. We looked around in some of the little gift shops for a while, but soon we were hot and tired. Apparently, so were a lot of other visitors. The most popular shop in the entire historical area was the candy shop, which also sold four dollar ice cream cones! 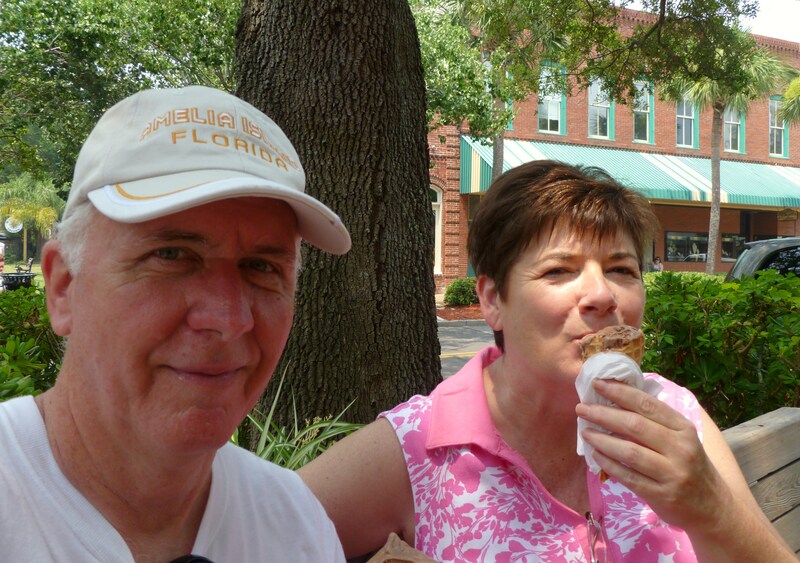 Of course, we had to have one anyway…but at least I passed up the Fernandina Fudge! Shortly after finishing those tasty ice cream cones, we looked around a little bit more, then headed back toward the beach to check into our hotel room. 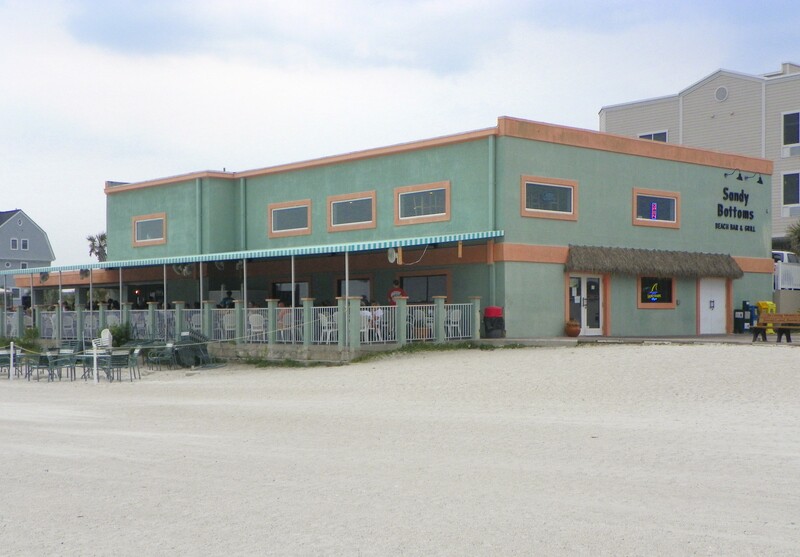 Before long, we checked in, had supper, then spent the rest of the evening sitting in our chairs on the beach, listening to a wonderful band playing “oldies” at “The Sandy Bottoms Beach Bar and Grill”! Speaking of “The Sandy Bottoms”, that’s where Ed and I ate dinner for our 39th anniversary! We’d never eaten in an open, seaside restaurant before, so we tried it. The food was very good–seafood, of course, and that particular evening they had a reggae band providing music. We didn’t totally break our tradition of eating at KFC for our anniversary–we went there for lunch! Wow, it’s hard to believe it’s been ten years already! It seems like just yesterday when the my husband and I were having lunch with our daughter–her last one as a single woman. We had Subway sandwiches for lunch on her wedding day, and as we were eating them, we made the comment that it would be our last such meal together…but we never lost our daughter. Instead, we gained another son…and five years later, we gained a beautiful granddaughter. Our daughter and her husband remind me very much of my husband and myself in so many ways. It’s not difficult at all to imagine the two of them growing old together. I can also visualize Madison growing into a lovely young woman, and one day eating her last meal–as a single woman–with her parents…in the same kitchen where her mom ate that Subway sandwich with us! I’d like to take this opportunity to wish Brandy and Clint a very happy tenth wedding anniversary with a special video that I put together for them. We love you guys! Enjoy your special day! Wishing you many, many, more happy years together. My six words: Celebrating 39 years of marriage today! 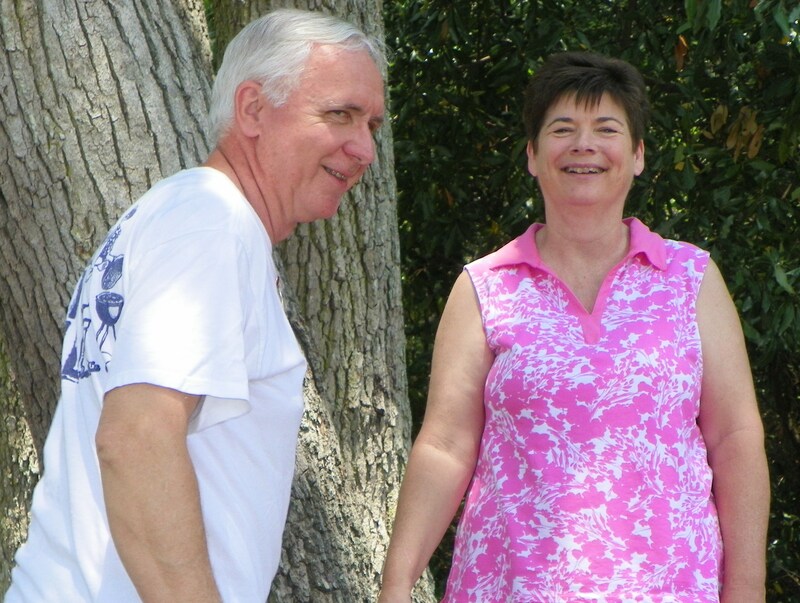 Tomorrow will be our actual 39th wedding anniversary, but we have plans to be relaxing and celebrating–beginning today! Since we will be busy the entire weekend, I’m writing and posting this early. It’s hard to believe that Ed and I been together nearly forty years! 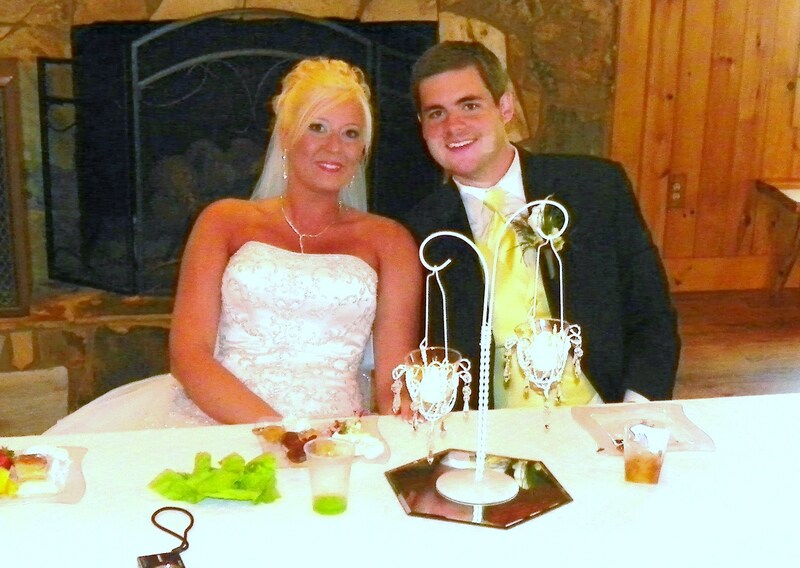 It seems like just yesterday, that we were a young couple, madly in love, and anxious to begin our new life together. We married in a whirlwind of excitement, then quickly settled down to the business of establishing our new life…as husband and wife. Following six wonderful, care-free, fun-loving, years as a couple, we eventually felt the need for “more”. Before long, God blessed us with our first baby, and over the course of the next seven years, He turned a loving couple into a loving family of five! We’ve had a few ups and downs, raised our three children, and faced our share of life’s challenges, but we’ve weathered it all–together. There have been a few hard times, but so many more good times! I wouldn’t trade a minute, because we experienced it all…together. Our bodies are changing, life’s challenges are getting a little tougher, but these days we’ve got a whole new role to fulfill–as grandparents. We’ll be making the best of it all…together. We’re still havin’ fun, and you’re still the one! Where does time go? 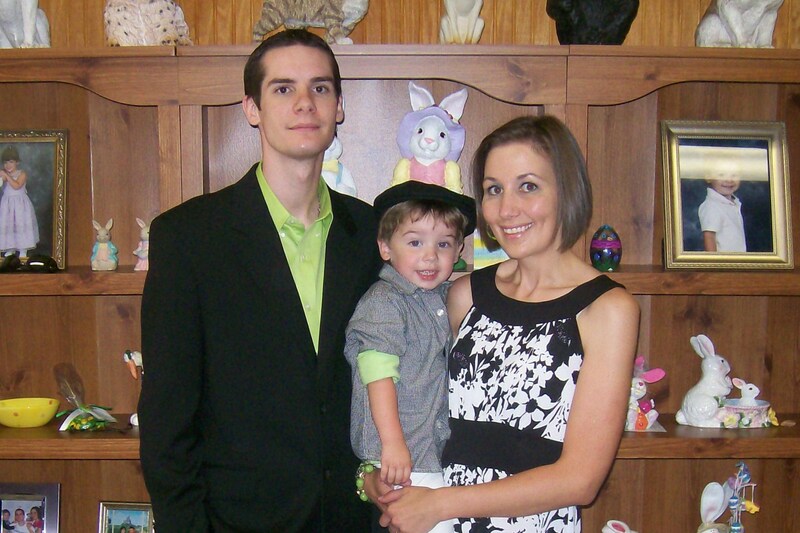 Five short years ago, our oldest son became a husband. He seemed so much older to me then…Looking at the photos of him, I realize how young he still was, and how much he still had to learn about life. Christina, the bride-to-be, did a wonderful job planning their wedding, and it was beautiful. She took care of every single detail, all we had to do was show up! The only glitch I can recall is a problem with a couple of the tuxedos. The couple got married on a sunny Saturday in May, and moved to a tiny little apartment in town. It was barely big enough to turn around in, but Christina made it a home. It broke my heart to see our son leave the family farm…but it was a joyous day when the couple moved back, just two short years later. Oh how happy we were to welcome the couple back home! Three more years have passed…The two are no longer a couple…They became a family with the addition of a sweet baby boy, two years ago! These days that couple is… little older, a little wiser, a lot happier, and much busier! Happy 5th Anniversary, Brett and Christina. I hope the best is yet to come… Best wishes to you always! 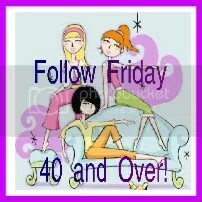 Thanks to Java for hosting Follow Friday. Hi everyone! 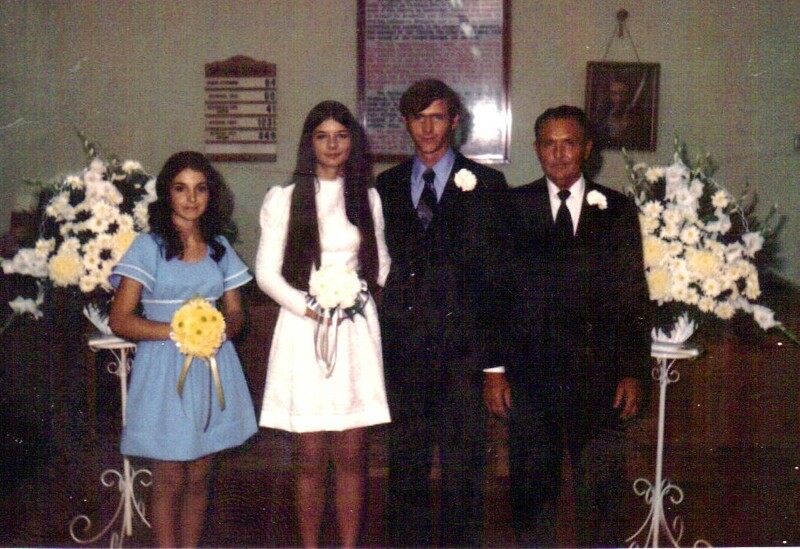 I’m joining in with Linda’s Flashback Friday today over at http://www.mochawithlinda.blogspot.com I hope Linda won’t mind, but I’m giving her theme of ” friends growing up” a slight twist because today is my wedding anniversary. I didn’t have a whole bunch of friends while growing up, but most of the friends that I had back then, still remain my friends today. I’d rather have a few faithful friends, than a bunch of “fair weather friends” any day. I didn’t have many friends in early elementary school because I changed schools four times by the time I was in the sixth grade. The seventh grade is when I began to make lasting friendships, because after the sixth grade my family stayed put! I always gravitated toward the new kids in class because I knew all too well what it felt like to be that new person! Four people immediately come to mind when I think of “friends from school”. First of all there is Karen. 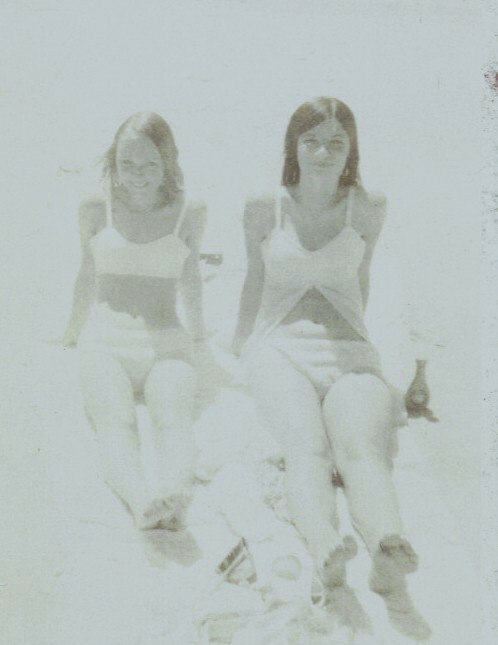 I met Karen in the ninth grade when her family first moved to town. We were friends all through high school, and she was my maid of honor when I got married. When I married and moved away, we would write each other letters. Later, when I moved back to town, we resumed our friendship. We remain friends today. I don’t see her often, but when we do get together, it’s as if we were never apart. We pick back up where we left off. The next friend who comes to mind is Diane. I met Diane when I was in the tenth grade. She was a senior that year. Even though she finished school two years ahead of me, we managed to remain friends–and we are still friends today. I always envied Diane because she could sew much better than I could! We actually made our bathing suits one year! 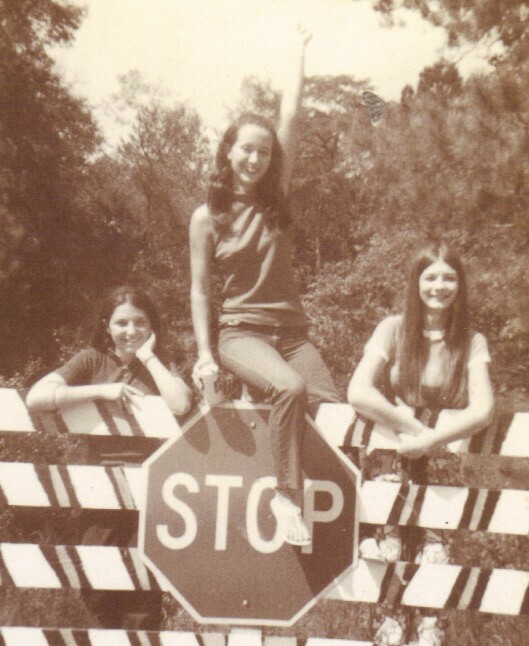 Her husband and my husband were best friends, and that’s how I met Diane. The two guys joined and served in the army together. At one point in our lives, after we were married, we all lived across the street from each other for several years. 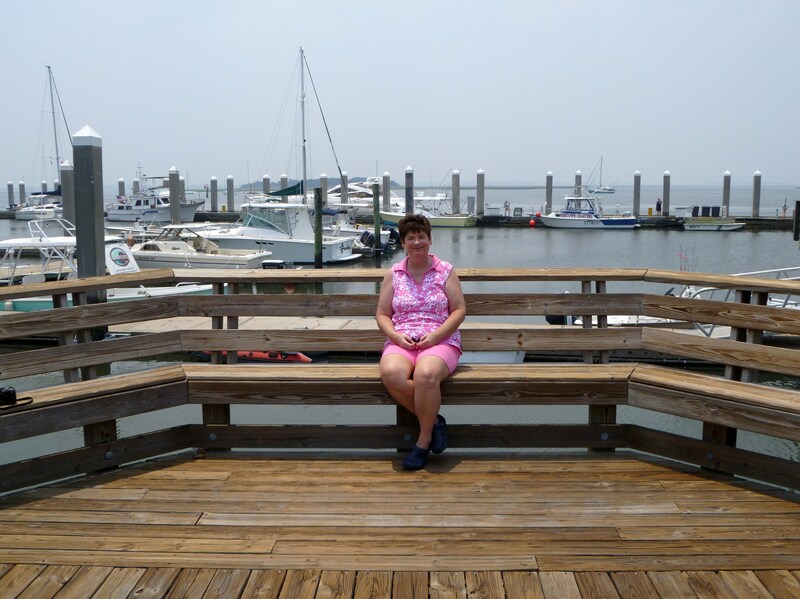 My husband and I eventually moved back to our hometown, while Diane and her husband stayed in the city. We still keep in touch regularly, and visit when we can. Holly and “Bo” married the following month after Ed and I did–right after high school, but their marriage did not last. Unfortunately, Holly fell in love with someone else while she was still married to “Bo”. We remained friends for a few years after she married the man that she left “Bo” for, but our friendship just wasn’t the same. “Bo” got cancer and died at a fairly young age, and I haven’t heard from Holly in years. I met my best friend in the world, and my future husband, Ed, when I was about to enter the tenth grade–I was fourteen years old on our first date. He was five years older than I was, so he was already finished with high school, and some college, too. Although there was a huge difference in our ages, it never seemed like it. We were a perfect match from the start. 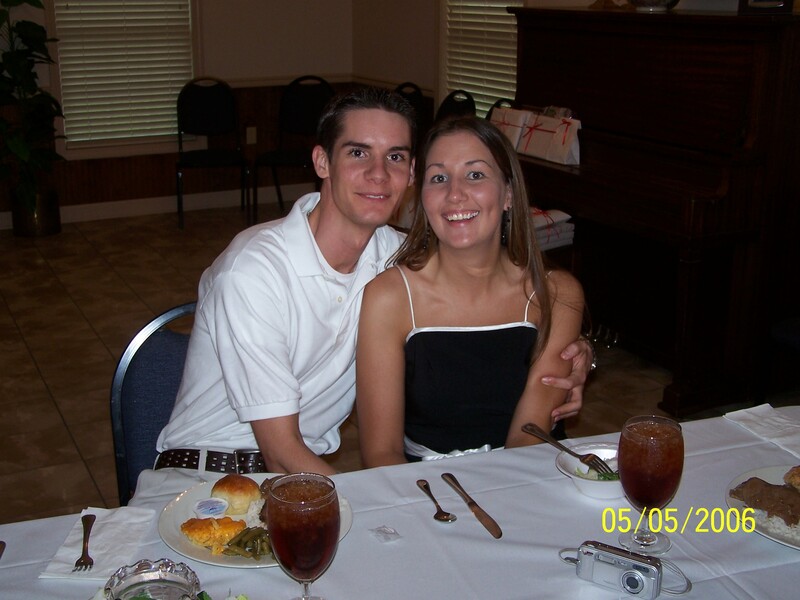 He had just joined the army when we met, so our courtship was “long distance” most of the three years that we dated. It didn’t matter, we knew that we were meant to be together. 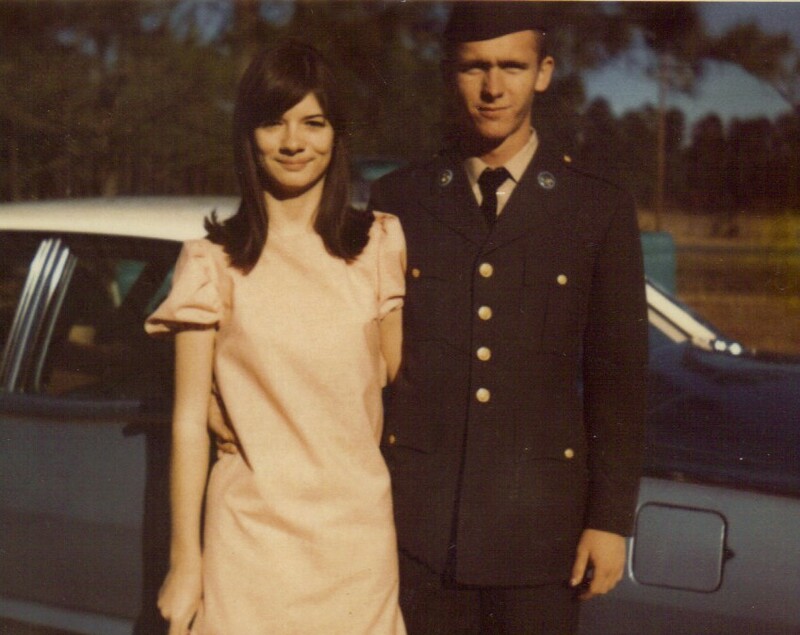 Ed and I were joned in marriage 38 years ago today–just three short weeks after the army and high school were behind us! He’s always there for me, and there is nobody else I’d rather spend time with than him. I believe that he feels the same way about me. I’ve never felt the need to “go out with the girls”, I’d rather be home with “my guy”. Ed’s never been one to “go out with the guys” either. Ed and I can talk about anything. He knows me better than anyone. We’ve laughed together, and we’ve cried together. We’ve gone through three pregnancies, three child births, and the raising of three teenagers–and we survived it all. We are currently enjoying our grandchildren together, and soon it will be retirement time… We’ve been together in sickness, and in health…for richer and for poorer….and we plan to be together until death eventually parts us. It’s wonderful being married to your best friend!